Five former members of the Stasi, the intelligence service in communist East Germany, have been questioned over the Lockerbie bombing. A German state prosecutor has confirmed the five were spoken to at the request of authorities in Scotland. It is part of the ongoing criminal inquiry into the atrocity 30 years ago. According to reports in Germany, the individuals were in their 70s and 80s, and were interviewed as witnesses, not suspects, over the last nine months. “These are solely witness interrogations,” a spokeswoman for the prosecutor’s office in Frankfurt an der Oder, on the Polish border was quoted as saying by Germany’s dpa news agency. 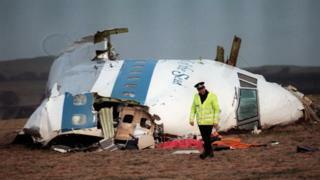 Pan Am flight 103 was brought down by a bomb over the Scottish Borders on 21 December, 1988. All 259 passengers and crew were killed, along with 11 residents of the town of Lockerbie. In 2001, a Scottish court sitting in the Netherlands ruled that the bombing had been carried out by Abdelbaset al Megrahi, a member of the Libyan intelligence service. Megrahi continued to protest his innocence until his death in Libya in 2012. Megrahi was jailed for life but released on compassionate grounds in 2009 when he had terminal cancer, and died three years later in Tripoli. Prosecutors at Scotland’s Crown Office have always said that Megrahi did not act alone and was one of a number of Libyans involved in bombing the plane. The prosecution case was that the bomb was placed in an unaccompanied suitcase and smuggled onto a plane from Malta to Frankfurt, where it was loaded onto a feeder flight to Heathrow and then into the hold of Pan Am 103. In 2015, the Crown Office asked the Libyan authorities for permission to interview two unnamed men who were in custody following the revolution which toppled Colonel Gaddafi’s regime. Prosecutors said there was a “proper basis in law” to treat the men as suspects. The men were Abdullah Senussi, Gaddafi’s brother in law and former intelligence chief and Mohammed Abuagila Masud. Senussi had been sentenced to death by a Libyan court that year but is still alive and in custody. Masud was sentenced by the same court to 10 years in prison for bomb-making. The prosecution at the Lockerbie trial alleged that Masud had been with Megrahi on the day the bomb brought down Pan Am 103. Former Stasi agents gave evidence during the trial about the agency’s involvement with a Swiss businessman who was said to have made the timer which triggered the Lockerbie bomb. The Stasi also featured in a documentary broadcast in 2015. It was made by American filmmaker Ken Dornstein, whose brother was on board Pan Am 103. The programme claimed that the Stasi had carried out surveillance on Libyan agents who bombed a disco in West Berlin in 1986. Three people were killed, including two American servicemen. The documentary said the Stasi had information that Masud was in West Berlin when the disco was attacked. On the 30th anniversary of the bombing last December, the Crown Office said the ongoing criminal inquiry had uncovered “intelligence and information supportive of the original trial court’s finding that the bombing was Libyan state-sponsored terrorism in which Abdelbaset al-Megrahi was a key player”. The Crown said its investigations were also contributing evidence in relation to other individuals “involved in the conspiracy to commit the atrocity”. Megrahi always protested his innocence. The Scottish Criminal Cases Review Commission is currently carrying out its own inquiry to decide whether his case should be referred back to the appeal court.